The Baltic Exchange's main sea freight index, tracking rates for ships carrying dry bulk commodities, fell for the fifth consecutive session on Friday as the capesize vessel segment marked its largest weekly decline in 16 weeks. The overall index, which factors in rates for capesize, panamax and supramax shipping vessels, was down 16 points, or 1.2 percent, at 1,366 points, marking a weekly decline of 8.3 percent. The overall index touched its lowest since June 22. The capesize index lost 80 points, or 4 percent, to 1,900 points. The capesize index fell 21.2 percent for the week, its biggest weekly decline since the week to May 25. 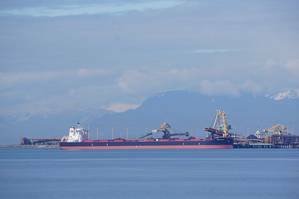 Average daily earnings for capesizes, which typically transport 170,000-180,000 tonne cargoes such as iron ore and coal, were down $364 at $15,574. The panamax index was down 11 points, or 0.7 percent, at 1,523 points. Average daily earnings for panamaxes, which usually carry coal or grain cargoes of about 60,000 to 70,000 tonnes, rose $91 to $12,219. The supramax index rose two points to 1,134 points.